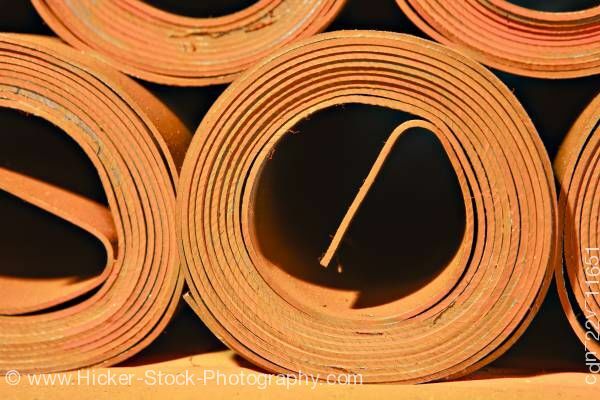 Stock photo of rolls of lead, Mississauga, Ontario, Canada. Storage of rolls of lead in Mississauga, Ontario, Canada. This stock photo shows rolls of lead stacked upon each other in Mississauga, Ontario, Canada. This view of the rolls of lead shows a complete round roll that is stacked among other partially shown rolls. There is one roll on each side and two stacked above. The lead is orange in color and rolled up. Each lead roll is wrapped around about ten times. The rolls of lead are supported on a wood surface. Lead is silver in color but tarnishes quickly when exposed to air. Lead is a very dense soft metal and is very resistant to corrosion which is useful to store corrosive materials such as sulfuric acid. Lead is also used in construction because of its resistance to corrosion. Unfortunately, lead is a poisonous material and can be damaging. Lead has been used for thousands of years as far back as the Bronze Age. Rolls of lead, Mississauga, Ontario, Canada.